As of October 1, 2017, the Division of Alcohol and Tobacco Enforcement will no longer offer recertification and renewal classes for Server Training. Anyone who needs to renew a current Server Training card may do so by completing the regular training in person or online. In 2016, there were 1,027 alcohol-related automobile accidents on Delaware roadways and 54 of those accidents were fatalities. Records indicated that 61% of the intoxicated drivers traveling on Delaware roadways were coming from commercial establishments. Alcohol is also a factor in about 50 - 70% of all the pedestrian fatalities in this country each year. Delaware law requires that anyone who serves, sells or handles alcohol must be trained in the State of Delaware. 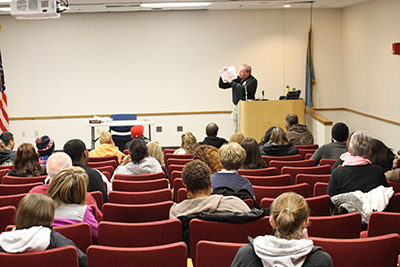 The mandatory Responsible Server Training Program was established by the Division of Alcohol and Tobacco Enforcement to educate servers on how to serve and sell alcoholic beverages in a responsible manner that is consistent with the rules of the OABC Commissioner and the laws of the State of Delaware. Responsible Server Training is available in two convenient formats - online and in person. The options listed below are recognized and approved by the OABC Commissioner and the Division of Alcohol and Tobacco Enforcement. This training is available at no cost and is held in all three counties each month. Agent George Merrill is currently assigned as the primary Trainer for this program, and teaches over 9,000 people every year how to serve alcohol in a responsible manner. Topics covered in the class include, How Alcohol Effects the Body, Checking ID, Recognizing the Signs of Intoxication, Title 4, and Commissioner’s Rules. View the training class schedule on Google calendar or call the Server Training Line at (302) 577-5208 for a list of training dates, times and locations in each county. A copy of the server training booklet is available here. Replacement cards can be obtained by calling (302) 741-2855 and leaving a message with your full name, date of birth, and a contact number, or you can fill out an online request. Only cards issued by the Division of Alcohol and Tobacco Enforcement can be replaced by us. If you are inquiring about replacing a lost or stolen online server training card, you must contact the vendor you completed the training through in order to request a replacement card.